PicoQuant Fluorescence Spectrometer – FluoTime 300 | EINST Technology Pte Ltd. 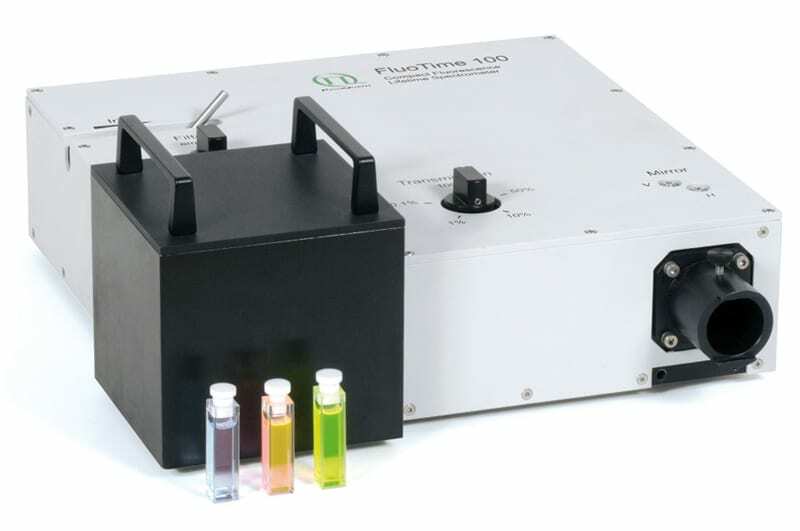 The FluoTime 300 “EasyTau” is a fully automated, high performance fluorescence lifetime spectrometer with steady-state and phosphorescence option.The FluoTime 300 contains the complete optics and electronics for recording fluorescence decays by means of Time-Correlated Single Photon Counting (TCSPC) or Multichannel Scaling (MCS). The system is designed to be used with picosecond pulsed diode lasers, LEDs or Xenon lamps. Multiple detector options enable a large range of system configurations. When used in combination with the PMA 175 that has almost no darkcounts, the system features an ultimate sensitivity with a record breaking 24.000:1 Water Raman SNR. The FluoTime 300 can be used to study fluorescence and phosphorescence decays from few picoseconds to several seconds. A newly designed series of sample mounting units is now available for the FluoTime 300. 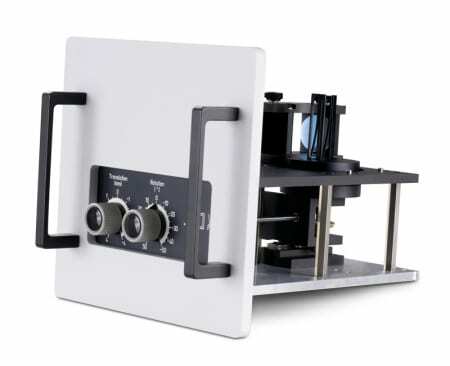 Each sample mounting unit is designed around modular sample holders (standard: cuvette, optional: front-face), which allow a quick and easy change between different sample configurations, e.g., liquids, powders, or wafers. Temperature control of the cuvette holder is possible by attaching an external thermostat (tubing for the circulating fluid is pre-installed) or with an optional peltier-cooled single- or multi-cuvette sample holder. 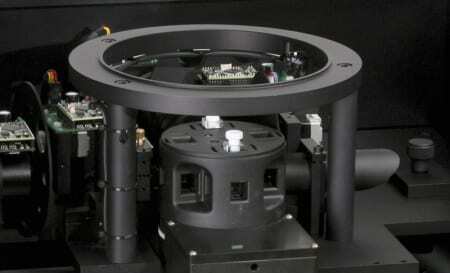 A cryostat can be integrated for measurements at low temperature. The range of available sample holders also includes a front face version for samples of up to 2 inch size. The holder permits to change position and angle of the sample with respect to the direction of excitation and detection from outside of the sample compartment. This special feature is extremely useful for an on-line optimization of the beam position on the sample while the measurement is running. The wavelength tunability and the variable repetition rates of the supercontinuum laser Solea, combined with the short pulse widths allows to perform excitation scans as well as fluorescence lifetime measurements over a broad spectral and temporal range with only a single laser. The Solea laser can be directly controlled from the EasyTau software. 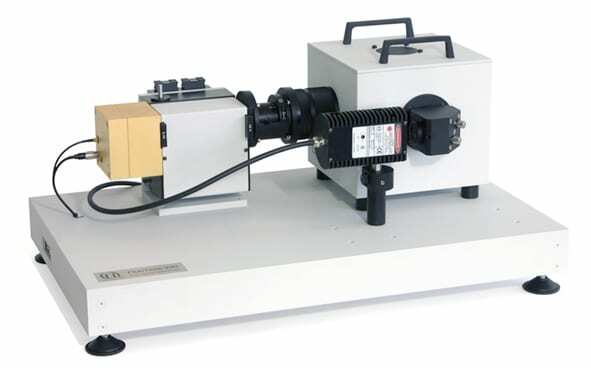 The FluoTime 300 is designed to be used with picosecond pulsed lasers, LEDs and Xenon flash lamps. Pulsed laser and LEDs are available in a very broad wavelength range from 245 nm to 1550 nm. They can be varied in output power and operated at any repetition rate from single shot to 80 MHz (depending on wavelength) as well as in pulse bursts at low repetition rate intervals. This special feature allows to match the excitation conditions ideally to the sample requirements, from fluorescence with short lifetimes to weak phosphorescence. A specialized driver unit of the PDL Series, the PDL 820, is used to control the individual excitation source. The FluoTime 300 can also be equipped with a Xenon arc lamp and/or a Xenon flash lamp which enable excitation at any wavelength from 200 nm to 900 nm. Along with a dedicated high-resolution monochromator steady-state excitation spectra become possible. Several outstanding data acquisition units are available for time-resolved as well as steady-state fluorescence measurements. The TimeHarp 260 PICO offers an adjustable temporal resolution from 25 ps to 5.2 ms and is therefore the perfect choice for measuring steady-state and time-resolved emission with lifetimes ranging from a few ten picoseconds up to several milliseconds. The TimeHarp 260 NANO is a dedicated MCS board that has a minimum base resolution of 1 ns and no dead time between channels. The TimeHarp 260 NANO is therefore ideally suited for steady-state measurements or for lifetime measurements up to the second time scale. Any of these data acquisition units are the perfect match for systems equipped with a detector of the PMA Series or PMA Hybrid Series. For measuring ultrafast dynamics the PicoHarp 300 offers an even better temporal resolution (4 ps) and is therefore recommended for FluoTime 300 systems equipped with a MCP-PMT detector. In that case even dynamics of tens of picoseconds can be resolved. The FluoTime 300 uses single photon counting detectors of various types, attached to an exit slit of the emission monochromator. The system can work with one or two detectors. The available detectors are either photomultiplier tubes (PMA Series or NIR-PMTs), Hybrid-PMT modules (PMA Hybrid Series) or Microchannel Plate Photomultiplier Tubes (MCP-PMTs). The detectors offer picosecond temporal resolutions and cover different spectral ranges between 180 nm and 1700 nm. Each detector includes an electro-mechanical shutter, optional cooling, and an overload protection that can be operated from the system software. The FluoTime 300 features an intuitive and easy-to-use system software. All measurement data files and all related analysis results are stored in a clearly arranged workspace, which resembles the familiar tree structure of a hard drive directory. Data dependencies are thus visible at first glance. Steady-State and time-resolved measurements can be performed alternatively from the same software interface.The software features three data acquisition possibilities. Specifically designed application wizards guide the user through the necessary optimization steps for performing typical measurement tasks such as fluorescence lifetime measurements, anisotropy measurements, collection of emission spectra or Time-Resolved Emission Spectra (TRES). For those familiar with the technique, a customized measurement mode for full instrument control is also available. More sophisticated application tasks, like, for example, alternating between time-resolved decays and steady-state spectra at different temperatures over night, can be easily performed through scripted data acquisition using the integrated scripting language of the EasyTau software. Steady-state data can by analyzed through the same software interface (arithmetic, integration, etc..) whereas time-resolved data can be directly transferred to the established FluoFit software . The FluoFit software features global decay analysis with an easy-to-use graphical user interface and presentation-ready numerical and graphical output. It implements an iterative reconvolution fitting routine with nonlinear error minimization. Various exponential decay models (up to fourth order) or rate constant distribution models can be fitted to the observed decay in order to determine the fluorescence lifetime(s) or to study fluorescence anisotropy, along with rigorous error analysis methods.